An authentic and vibrant cookbook, with over 100 recipes for delicious vegetarian Indian food from Ramsay's Best Restaurant runner-up Prashad. The Patels and Prashad, their small Indian restaurant in Bradford, were the surprise stars of Ramsay's Best Restaurant TV show in autumn 2010. Everyone who saw them fell in love with this inspirational family dedicated to serving delicious, original vegetarian food. At the heart of the family is Kaushy, who learned to cook as a child growing up on her grandmother's farm in northern India. On moving to northern England in the 1960s, she brought her passion for fabulous flavours with her and has been perfecting and creating dishes ever since. Never happier than when feeding people, Kaushy took her son Bobby at his word when he suggested that she should share her cooking with the world - a launderette was converted first in to a deli and then a restaurant, and Prashad was born. 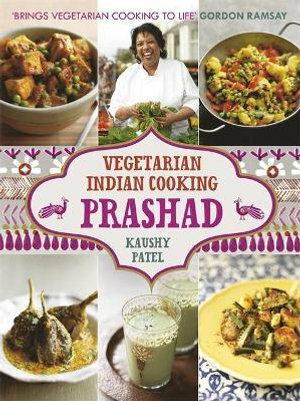 Now Kaushy shares her cooking secrets - you'll find more than 100 recipes, from simple snacks to sumptuous family dinners, to help you recreate the authentic Prashad experience at home. Whether it's cinnamon-spice chickpea curry, green banana satay, spicy sweetcorn or chaat - the king of street-side India - there's plenty here for everyone to savour and share.